In Mali, the horseman/horse & rider is a statement of nobility. This is true in many of the tribes including the Dogon. 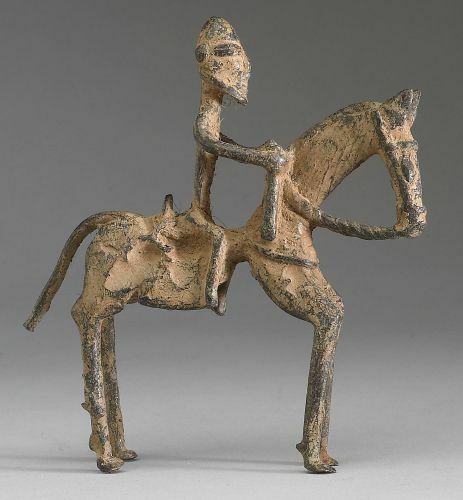 In the Dogon culture the horse & rider also represents the Hogon, the spiritual leader of the community who acts as mediator, judge & guardian of the village. 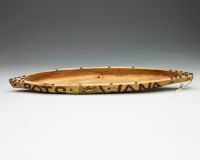 He is integral in maintaining the delicate relationship between his people & their ancestors & the powerful spirits of the bush. In Dogon lore Lebe, the first Hogon, changed into a powerful snake. This snake is an important element of many Dogon rituals including the circumcision rites of boys. Lebe is the embodiment of man & the supernatural, representing the vital forces of nature. The nobility of the Malian aristocracy is portrayed in this weighty bronze Dogon horse & rider which shows a fine patina.